The trophy had been left unattended during the clean-up after the event. 2018 Tour de France winner Geraint Thomas. 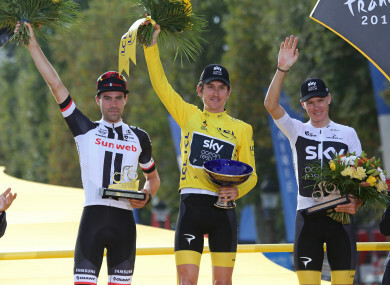 THE TOUR DE France trophy won by Welsh cyclist Geraint Thomas this year has been stolen. The trophy, one of the three Grand Tour trophies, had been on loan from bike manufacturer Pinarello before the theft at a cycling show in Birmingham NEC, held at the end of September. Team Sky had been displaying the trophies around the UK. In a statement today, Team Sky said that the trophy had been momentarily left unattended during the clean-up after the event. Tour de France winner Thomas said today that it was an “incredibly unfortunate” occurrence. It goes without saying that the trophy is of pretty limited value to whoever took it, but means a lot to me and to the team. The theft is now subject to a police investigation. Email “Tour de France trophy stolen from Birmingham NEC”. Feedback on “Tour de France trophy stolen from Birmingham NEC”.